Sun exposure, over work and sleepless nights, acne scars - whatever the cause, a dull and lifeless skin or skin with dark spots and other blemishes can do with a little pampering and nourishment. If you are faced with such issues, go for a beauty facial at Kaya Clinic. When you have been neglecting skin care, or you have pigmentation issues, your skin can look patchy and dull. Maybe you have been too busy, on a tight schedule both at work and at home. Maybe you have just recovered from an acne breakout that has left post acne blemish marks on your skin. You just came back from a hiking and camping trip, which, though it was fun, the skin tanning has left your skin looking rough and uneven, with dark spots and patches. May be, as a natural result of ageing, you have age spots or patchy skin and your skin has lost its old firmness and glow. Take a break from your daily routine, and go for a skin rejuvenating treatment at Kaya. A facial that involves a deep massage is just what your skin needs to enliven it. Kaya Skin Clinic offers a range of facials targeting different issues. These can all help provide nourishment to your skin, and remove blemishes. But each facial focuses on one special effect, like deep hydration, skin detoxification, rejuvenation, age reversal, or skin lightening. At Kaya, your skin is examined for the deep causes of your issues and then the proper treatment is suggested. If you are looking for a fairness and rejuvenating facial, you may want to choose the Luminous Radiance Therapy. This treatment begins with a Microdermabrasion that exfoliates your skin and also resurfaces it, removing slight bumps and scars. This removes skin blemishes and peels off the layer of dead skin cells, exposing the fresh new skin underneath. This removal of dead skin cells also stimulates cell renewal, resulting in the creation of new skin tissues. After the microdermabrasion, your skin is cooled down and then a facial massage begins. Using a face cream that contains elastin and collagen, the massage infuses your skin with ingredients that are needed to nourish, and rejuvenate it. Elastin and collagen are structural proteins that give form, firmness and suppleness to your skin. You lose these proteins as you age, and this massage cream helps restore them. The intense massage also helps to improve blood circulation in your face, making it look fresh and radiant. Your skin regains its natural glow and even complexion. If your pigmentation issues persist, you can try another facial after sometime, the Intense White Luxe Therapy that uses peels and skin nourishing creams to get rid of pigmentation and give your skin a flawless look. This product helps in dealing with hyperpigmentation issues. After getting beauty facials and more intense pigmentation reducing therapies at Kaya, you will need a way to retain the good effects of these treatments. This Pigmentation Reduction cream is a product that, like all Kaya products, has been designed by dermatologists and tested for effectiveness. It comes in a bottle with a pump dispenser that enables you to get just right amount of the cream you need. Though it has a creamy texture, it is very light and as soon as you apply it, penetrates into the skin. It also moisturizes the skin, so it is good for all skin types, oily or dry. It contains Azelaic Acid, Phytic Acid etc., which are all good at reducing pigmentation marks and in controlling Melanin production. Just take a coin-sized drop and apply it on your face and neck, after cleansing them. Use daily for best results. Take good care of your skin, it does not just help you look good, your skin is also your first line of defense against external factors that can affect your health. Limit your consumption of oily foods, stick to a well-balanced diet that provides you all the nutrients you need. Go for periodic skin treatments at skin care providers like Kaya, to get flawless skin. Women, Deal With All Your Hair Fall Woes Once and for All! Thick, luscious hair is what most people aspire to have. Maintaining strong and healthy hair will take a lot of effort on your part, but it pays off in the long run. You will have to take excessive care of your hair when you deal with problems like hair fall. Waking up to find your pillow covered with a few strands can be disheartening. If you have reached a point where combing seems like an arduous task because of all the hair fall, it is time you take action. Hair fall is one of the most common issues in most women. While losing a few strands a day is normal, if it is a noticeable amount, it is a concern. Hair fall can be the result of several problems. The root cause differs from person to person. Common factors that may influence the condition are age, pollution, lifestyle, and lack of required nutrients. One way to deal with the issue is to find a solution that will make the roots if your hair stronger. This is bound to reduce your hair fall as well. You can find this in the Kaya PRP treatment for hair. PRP stands for platelet rich plasma. This is a Kaya hair care treatment where blood plasma is used to treat hair fall. Blood plasma has 5 times the number of platelets you find in blood. It also has a growth factor that will help with hair growth and wound healing. There are bioactive proteins that will improve the hair growth creating a long-lasting effect. This is a therapeutic process where there is no surgery involved. It is a common hair loss treatment used for patients who experience hair loss. It is a part of a recent breakthrough where the benefits of PRP were uncovered. This has been implemented by Kaya after it received all the necessary approvals. The treatment offered by Kaya is very straightforward and transparent. You can find out all the details of the procedure before you undergo it. You can also consult the dermatologists and learn more about the procedure in advance. This will keep you prepared for it. ● A routine procedure is done where the patient’s blood is first drawn. The blood is then centrifuged and the platelets are separated. This part of the plasma is what is used in the PRP treatment. It is rich plasma that will help with healing and tissue regeneration. ● The proteins that can interrupt the process are removed and so the experts are left with a rich concentration of the platelets. It is then directly applied to the scalp in the areas where the hair loss is prominent. ● Before this, the scalp needs to be prepared to receive the treatment. The scalp is stimulated to make the healing active. An anesthesia is given on the part where the PRP is to be injected. Once that is done, the PRP is directly injected into the scalp. The hair is then washed and the patient is free to leave, There are no medications or products for hair fall that need to be used after the procedure. The patient can, in fact, feel perfectly normal after the procedure. How Often Is PRP for Hair done? Depending on the extent of hair loss, the dermatologists will suggest the period after which the procedure is to be done again. It can be repeated at any intervals between 1 and 9 months. However, a gap of 3 or 4 months is given between two procedures. You can visibly notice the improvements in the first 3 to 6 months. The treatment must be continued to maintain the hair growth. Kaya Clinic has been in the market for several years now. They have products that are effective and have nothing but positive results. The best service for hair fall is indeed the PRP hair treatment. Tired looking eyes, with bags under them, and dark circles are common problems, with many causes. There are ways to avoid them and treatments to reduce and control them. You can opt for good under eye bags cream and other skin care products from reputed names like Kaya. For a good proven under eye treatment, use Kaya Lighten and Smooth Under-Eye Gel. It contains Haloxyl that helps reduce dark circles and tones and firms up under eye skin. Kaya Clinic also offers a great dark circle reduction treatment using a Glycolic Peel. Acne is a common problem among teens; however, it can last beyond the teen years in people with oily skin. It is an irritating skin condition that leaves behind skin blemishes even after the breakout heals. Kaya Skin Clinic provides several solutions to acne and acne scars, depending on the level of severity. This is a wholesome 360° approach to acne treatment. Kaya has a wide choice in treatments for acne, from skin care products to peels to laser treatments and so on. The 360° method makes use of a selection of peels and acne control products. At Kaya, a dermatologist does a thorough analysis of your skin, and notes down your acne condition and history. The severity of the problem is assessed. The skin analysis helps the doctor understand your skin’s condition - its pH balance, hydration levels, and oiliness and so on. With all this information at hand, the doctor can come up with a precise solution for the problem. Some acne cases are very mild; these do not need advanced treatments and therapies. For these, the doctor may suggest a few good anti-acne products to use, and a skin care routine to follow. These could help keep your acne condition in check. For more severe cases of acne, the 360-degree system provides many different peels and products. These peels help exfoliate the skin, reduce pigmentation and scars, and encourage skin tissue renewal. After the appropriate treatment, in keeping with Kaya’s holistic approach, you may be given a special diet plan to avoid further acne breakouts. You may also receive suggestions on skin care routines and certain products that will treat and prevent acne, like Kaya’s Kit for acne-free skin. Based on how severe the skin issue is, the type of peel chosen differs. Superficial peels provide gentle exfoliation and work only on the outer layer of the skin. Medium peels penetrate deeper and touch the middle layer of the skin. A medium peel provides deeper cleansing and exfoliation, and is used to treat issues like freckles, age spots etc. Deep peels penetrate the middle layer of the skin, removing dead skin cells and other impurities and stimulating skin renewal from deeper levels. Skin peels can be used to treat pigmentation, acne scars, fine lines, and superficial wrinkles. Kaya’s Rapid 360 degree system uses a number of peels for acne including a black peel, intense clarity peel, the Pure Pore treatment and so on. The Black Peel: This peel uses a base of black vinegar. In addition, it also includes minerals and amino acids essential for skin health. This peel removes the dead cells in the outer layer of the skin. This exfoliation stimulates new cell growth to reduce acne marks/pimple marks. The scarred and discolored skin is replaced by new, blemish free skin. Intense Clarity Peel: This is a three-pronged treatment for acne scars that combines dermal peel with skin whitening agents, and then adds home use products to promote and maintain skin texture and color. The dermal peel exfoliates and speeds up skin tissue turnover. This helps reduce the scarring. Skin whitening bio agents are used to lighten pigmentation, thus ensuring an even skin tone. After this, you are given a set of home use skin care products. These help the skin continue with its healing and rejuvenation process. Pure Pore Treatment: This facial therapy uses serums, creams, masks and peels to cleanse and nourish your skin from deep within. The treatment makes use of salicylic acid, a special tea blend, a sea mud mask that contains minerals and Ichthammol, all combining to provide deep cleansing. A soothing serum and a mask of buttermilk and the tea mix help to calm the skin. Then your skin is treated with a cream that further helps absorb excess oil, while hydrating, protecting and nourishing your skin. Kaya Clinic also offers a variety of products for acne prone skin. The treatment is chosen based on how serious your acne condition is. The Rapid 360° system helps control and cure acne, and clears scars and pigmentation to give you blemish free skin. It also aids in preventing further acne breakouts. If you have oily or combination skin, you are unlucky in that, your skin is easily vulnerable to acne. You may need a special arsenal in your skin care kit to combat zits and breakouts. 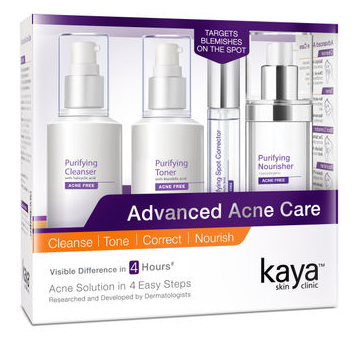 The Acne Care Kit from Kaya Skin Clinic might provide you just what you need. Acne is caused by excess secretion of body oil that blocks skin pores. The oil, sebum, is essential for skin health. Still, when it's production goes into overdrive due to reasons like hormone fluctuation, injury etc., it can cause the very things it is meant to prevent - skin eruptions, infections etc. When excess sebum collects in pores, it also allows other debris like dead skin cells and hair follicles to stick to it. This slowly plugs the pores. This gives rises to comedones like blackheads and whiteheads. If ignored, this can progress into pimples, pustules and serious acne breakouts. You will then have to look for some of the best cream for pimples, and other remedies. Good skin care routines like cleansing, use of scrubs, using water-based or gel-based skin care products instead of oil or cream-based solutions can all help mitigate the problem. However, you need some products in your kit that are designed to specifically deal with excess oil, acne, and related problems. Look at this set of advanced products from Kaya. What does your daily skincare routine involve? You cleanse your skin; you then apply a toner to tighten the skin. You also apply a moisturiser. Many oily skinned people fall into the error of thinking; they do not need a moisturiser because of their oily skin. However, any kind of skin loses moisture through the day and needs it to be replenished. Also, every time you wash your face with water, it oddly enough, strips your skin of its moisture content. So, everyone needs a good moisturiser. Oily skinned people should just avoid those thick creamy ones altogether. This set of products has been specifically designed for those suffering from advanced forms of acne, not just mild comedones. The kit contains four skin purifying products, three for daily use and one for targeted fast-acting treatment when needed. All the products in this set are free of added fragrance. Purifying Cleanser: This deep cleaning yet gentle cleanser contains Salicylic Acid, which clears clogged pores and exfoliates your skin. This effectively removes the base cause of acne, clogged pores. The olive oil content in this cleanser ensures that all this cleansing and exfoliation does not leave your skin feeling dry and stretchy. Olive oil is also very beneficial for skin health besides being a good moisturiser. Purifying Toner: This toner is lightweight, alcohol-free and easily penetrates into your skin with all its beneficial ingredients. It contains Mandelic Acid, which provides gentle exfoliation. This helps stimulate skin tissue renewal. Mandelic Acid also strengthens collagen. The Niacinamide, a form of Vitamin B3, also helps in fading away acne marks and pigmentation. This toner ensures that your skin is free of excess oil and helps close open pores and tighten the skin, providing a firm and youthful look. Purifying Nourisher: This moisturising nourisher provides several benefits. A light, gel-based product gets absorbed immediately. The Aloe Vera present in it nourishes and hydrates the skin. Almond oil and Rose extract provide further nourishment and hydration, giving your skin a smooth oil-free look. Purifying Spot Corrector: How many times have you identified a zit just before a party or a date with someone special, and wished you could point at it, say “off with you, you ugly spot” and make it vanish? Now, maybe you can, with the help of this spot corrector. Apply it over the zit, and you may notice that the swelling and irritation reduce quickly. A good acne treatment product to have on standby, just in case. These products help to treat acne, reduce acne marks/pimple marks and prevent acne. In addition, you may also seek some special facials for acne prone skin, to keep your skin blemish free. A healthy skin care regime is essential to age gracefully. Pollutants, dirt, and dust can damage your skin and make it dry. Make sure to take good care of your skin to slow down the damaging effects of the harsh environment. Good skin is something that everybody desires. Healthy and naturally clear looking skin makes you look beautiful and boosts your confidence as well. These are the most prevalent skin problems suffered by people. It is perceived that a lot of people do not try to find out the causes behind them and instead try experimenting with products in the market. Most of the time it worsens the existing problem. Furthermore free radicals, unhealthy eating habits, consumption of less water and aging too impact the skin’s health. Here, we will look into skin pigmentation in detail and learn how to treat it. Skin pigmentation is a stubborn skin disorder that results in either skin lightening or darkening. Your skin appears to be discolored or patchy. Melanin is a pigment that controls the color of your skin. Overproduction or underproduction of melanin causes skin pigmentation. Melasma: This is one of the most common skin disorder that causes brown or gray-brown skin patches on the skin. Women are more prone to getting melasma than men and it is even more common during pregnancy. Skin care products, sun exposure, and hormonal changes cause melasma, but a good-quality sunscreen can prevent melasma. Age Spots: They are also known as liver spots and occur due to overexposure of the skin to the sun. People with fair skin and people above the age of 40 are more prone to suffering from age spots. Frequent skin tanning can also cause age spots on your skin. Brown Sun Spots: As the name suggests, sun damage causes brown sunspots and mostly appear in the areas that are exposed. Hyperpigmentation: A common skin disorder caused due to excessive production of melanin. This leads to discoloration of the skin and forms dark patches. Kaya Skin Clinic is a dermatologist brand that offers safe and non-invasive treatments for different skin problems. This includes skin pigmentation as well. Kaya Insta Clarity Laser/Q Switch is curated to cure skin pigmentation and give you an even-toned skin. This is a safe procedure that targets skin pigmentation. It helps to get rid of hyperpigmentation which causes uneven skin tone and dullness. The Kaya Q-switched laser is perfect for Indian skin and treats all kinds of pigmentation with the help of an invisible beam light. The laser focuses only on the parts of the skin that are pigmented, which means that the unaffected areas of the skin remain untouched. The pigment absorbs laser and disperses. A single session of this laser treatment does not last for more than 15-minutes. And you get to see visible changes just after one session. However, at least 6-8 sessions are required to get the results that you are looking for. Insta Clarity Laser can be used to treat skin pigmentation on any part of the body. If you are one of the many who are suffering from skin pigmentation, book an appointment at the nearest Kaya clinic and get your skin treated. Read Kaya Q switch laser review to know the outcome of this treatment. What Kaya offers with their Expert Dermatologists? In today’s day and age, who doesn’t struggle with skin problems? Everything from dark under eye circles, to patchy pigmentation, skin problems affect people of all ages and genders. There isn’t really a way to completely avoid them, but there is a way to make it easier on yourself. A good doctor can mean the difference between an unhealthy skin that can age and an enviable skin glow. If you want a perfect flawless skin, no one understands this better than an expert dermatologist does. If you’re looking for top dermatologists, but aren’t able to find one that takes your skin condition seriously, then you’re not alone. Many men and women today struggle to find the best skin doctors, but Kaya ensures that your skin gets what it deserves. Everything from expert dermatologists to treatments to all skin or hair related conditions, Kaya strives to be the best at what it does. Kaya Skin Clinic has a whole range of services and procedures for all kind of skin ailments. This could be something serious like Melasma, or something we all struggle with like dark circles or acne scars. Be it pigmentation or a dull skin cell turnover, Kaya has a solution for you. These solutions can be in the form of masks and facials, to expert treatments that remove the problem from the root. However, amidst all of these options, it is natural to feel lost or not know where to begin. This is where Kaya’s consultation comes in. Kaya offers you consultations with expert dermatologists and trichologists to extensively examine your skin and provide the right solution for it. Kaya makes it a rule that your skin is properly examined before you are offered a treatment. Every time you walk into a Kaya, be it Mumbai, Delhi, Kolkata or Bangalore, you will be assigned to a dermatologist who will listen to all your skin and hair concerns, and assess the needs of your skin. Only based on this consultation will you be offered a treatment. Your skin, much like everyone else’s, requires unique care. There is no standard treatment that works for every skin type on every person. Once your consultation is done, you will get a customized solution that concentrates on your skin’s needs. This customization is done by a team of expert dermatologists and beauty technicians. During this time, they also keep in mind any allergies you might have to give you a personalized treatment. Once a treatment is finalized, it is tested on a small part of your skin. This is to ensure that it does not cause any irritation or problems. If there is some irritation, the formula is altered accordingly. Once this is all done, the treatment is carried out. Most treatments at Kaya are done in sessions. You may require three to four sessions, depending on what results you’re looking for. Even when the treatment is being administered, there is an expert dermatologist present with you throughout the whole procedure, if not performed by the expert dermatologists themselves. This is more so important in cases, which require specialized tools or machinery, such as the derma roller used to treat pigmentation and scarring. Kaya has a widespread presence all over India, making it easy for almost everyone to give their skin what it needs. Looking for a dermatologist in Mumbai? Kaya is the place to be. Find some of the best trichologists in Mumbai at your nearest Kaya Clinic to treat your hair and scalp. Besides custom treatments based on consultations, Kaya also has a range of products available in retail stores along with their own website. This way, you can pamper your hair and skin to expert treatment every day. And each of these products is developed and tested by dermatologists. Pigmentation results in patchy skin, dark spots, and so many other blemishes. You can treat these with good pigmentation reducing products. Still, to give your skin a kick-start in recovering its glow, you can try some of the special facials offered by Kaya Clinic. The sun, hormonal fluctuations, some drugs - so many things can trigger an increase in melanin production. This results in dark spots, melasma, dark circles under the eyes, uneven skin tone and other problems. Deep pigmentation is hard to get rid of. It may take a long time to fade away even if you use the right skin care products. Go to Kaya Clinic for a consultation and get the appropriate treatment for your needs. Kaya offers a range of facials depending on the issue you have - acne, pigmentation, oily skin and so on. For those suffering from pigmentation, Kaya’s solutions include the Intense White Luxe Therapy, Lighten and Detan Facial, and Aqua Radiance Facial. Whether you are having a major problem with skin blemishes or not, your skin needs some occasional pampering, especially your face. 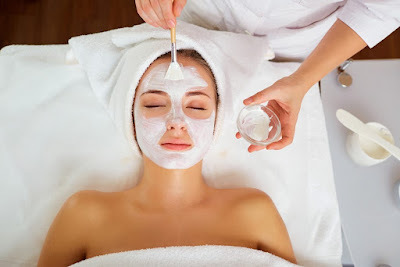 If you have not had a soothing facial in a long time, you may notice your skin showing sign of dullness and patches of discoloration that you have been ignoring. Fix an appointment at your nearby Kaya Skin Clinic for this lighten and refresh therapy that helps get rid of uneven skin tone and skin dullness and makes your face look glowing again. It begins with the beauty technician gently cleaning your face and applying a toner. Then your skin undergoes exfoliation. A peeling cream is applied over your face and left to dry. When it is peeled off, besides removing dead cells and dirt, it also helps in reducing the effects of pigmentation. Next, a combination of a serum and a brightening cream is applied on your face, and then the therapist gives your face a soothing massage that lasts for around 15 minutes. After this, another peeling treatment follows. This time, a peel-off mask is used. This mask contains Vitamin C which has many beneficial effects on skin health. After this second mask is removed, the skin lightening cream is once again applied. The facial ends with the application of a sunscreen to protect your skin against UV rays when you leave. Your skin looks much brighter when the process is finished. As the good effects continue, your skin tone condition improves over the next few days. It is not necessary to stay out in the sun for long hours to develop pigmentation issues. Cumulative effects of daily exposure to the heat and UV rays of the sun, even for a few minutes each day, can also contribute to hyperpigmentation. You face becomes discolored and dull over time. Rejuvenate the skin and acquire the radiant and silky-smooth looks you crave though this skin whitening facial. The process starts with a deep exfoliation and skin resurfacing through a safe Microdermabrasion. Then your skin is soothed with an application of a cooling Aloe Vera Gel that also heals and nourishes your skin. The next step uses an Antox Vit C Serum that is enriched with Vitamin C. This helps control the activities of free radicals and encourage cell renewal. Finally, to lighten your skin tone and reverse the effects of pigmentation, a special whitening mask developed by Kaya, with BioWhite for effective and quick results, is applied over your face. This facial does deep exfoliation and cleansing and then infuses your skin with many nutrients. This helps to restore brightness and vitality to tired, dull skin that has been exposed to various external forces that inflict damage like heat, dust and pollution. The process includes a micro dermabrasion treatment. This step removes dead skin cells and dirt, thus providing effective exfoliation that clears up the pores. This makes them ready to receive the nutrients delivered in the next step. The next step is a relaxing massage using a cream that is infused with tissue forming proteins, collagen and elastin. These are the basic building blocks of skin tissues that give it form, structure and flexibility. This soothing massage also helps revive your skin by increasing blood circulation in the region and by aiding in skin cells renewal. The old dull, discolored skin will soon get replaced by new and even toned skin. Finally, a thermal mask is applied, which gently warms the skin and helps it absorb all the nutrients and compounds in the cream that was applied in the previous step. The effects of this facial can be felt even a few days after the session, as your skin tone improves and you feel your skin acquiring an even texture and glow that lasts for quite a while. All these facials help you get rid of skin tanning, age spots or patchy skin, or any post acne blemish, and the skin whitening effects help you get a smooth, toned, and even complexion. Get rid of skin dullness and get flawless skin with Kaya beauty facials.